Although glazing had been in use for 100s of years in the Near East, early Muslim potters found themselves increasingly experimenting with polychrome glazes. 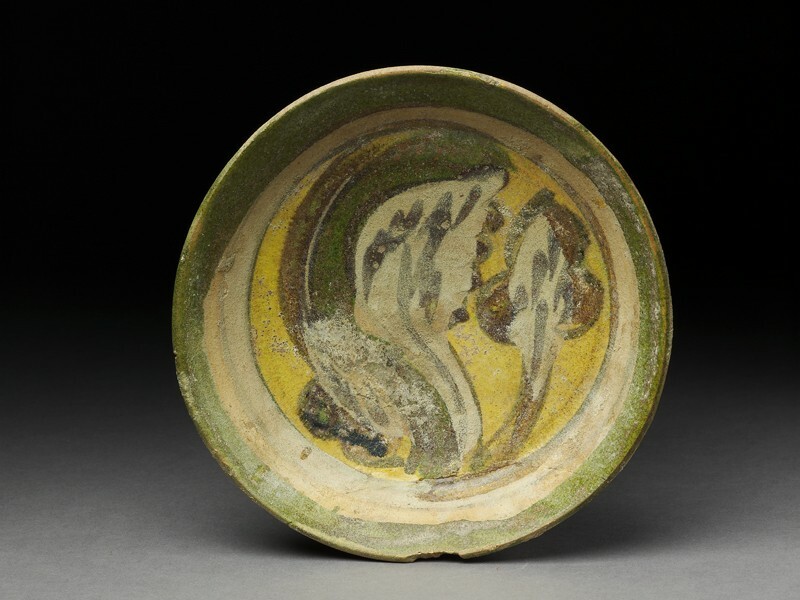 This plate, decorated with lead-based glazes in green, yellow, and brown, has been intepreted as an early, although only partially successful, attempt to combine different colours side by side on the same surface. Presented by the American Research Center in Egypt, 1974. Two different traditions of glazing were inherited by the Muslims through their conquest of the Near East in the seventh century. In the east the Sasanian Persians had used a glaze fluxed with soda or potash, called an alkaline glaze. In the west the Romans had developed a glaze fluxed with lead-oxide, called a lead glaze. 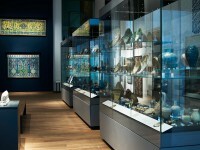 The earliest Islamic wares of Egypt continue the latter tradition, but show that a new period of experimentation was under way. For among the 8th century glazed objects given to the Ashmolean from the American Research Centre in Egypt’s excavations at Fustat (Old Cairo) is a bowl with a very uneven, speckly, monochrome green lead glaze. This suggests itself an early experiment with glazing. Secondly there is a fragment with broad stripes in green, ochre and dark brown, suggesting a phase of putting different coloured glazes side-by-side on the same object. Thirdly there is the bowl illustrated here in which the different glazes – green, brown and yellow – have been used to portray a highly stylised peacock. Although the design itself is remarkably sophisticated, it is evident that the experimental phase is not yet complete, for, alongside the decorated areas, the potter has left parts of the bowl surface completely unglazed.